Master Daniel del Cavallo posted this essay on his Facebook page, and graciously agreed to share it with the Gazette. What is a peerage in the SCA? 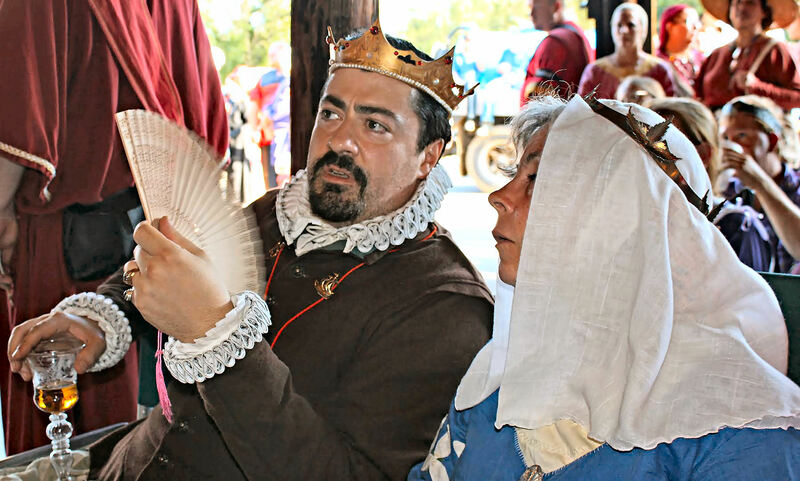 Master Daniel del Cavallo with Duchess Meirwen uerch Owein. Photo by THLady Sophie Davenport. I’ve been asked this question quite a few times over the years. Recent occurrences have motivated me to put my thoughts in writing and in public for all to see. It’s a topic that is far more subtle than it might appear. Let’s begin with semantics. The word “peer” is defined as: “one who is of equal standing with another.” On the face of it, this seems counterintuitive. If a peerage is considered one of the highest honors that can be attained, and candidates are “elevated” to this rank, then how does that equate to equality? In the context under consideration, this phrase literally indicates social standing relative to the King and Queen. A Peer is considered Their social equal. Or was. It seems this was only the case in earlier periods, relating to landed nobility acting as regional administrative proxies for the Monarch. Clearly, however, a peer did not wield the same power as the Monarch. Much of the authority to actually get things done was still reserved for the Crown. A monarchy wouldn’t be very effective otherwise. To make things extra confusing, the Monarch was seen as the source from which all dignity was derived. As such, he could not hold peerage titles since he, by definition, held them all. If a peer should ascend the Throne, any peerage titles he held would simply dissolve into the Crown. As time went on, an ever more complex hierarchy evolved within the ranks of the Peerage. The interplay between the seemingly discordant ideas of equal social standing with the Monarch, and reservation of sovereign power to the Crown is still expressed in the relevance of majority polling amongst the orders of highest merit. The SCA is a game. It has rules. The game and the rules are based on unrepentantly romanticized notions of chivalry and honor in the late medieval period. However, there are only so many things that can be romanticized away; some of the remainder may seem like negatives when viewed through the lens of our modern sensibilities. For example, a hierarchy exists. It exists for a purpose. That purpose is not, as some suppose, to form cliques. It is not to play keep-away. It is not to denigrate others, and make them feel unworthy for some nefarious, egocentric reason. Its purpose is to inspire. It exists to cause people to strive for excellence. Its goal is not to encourage people to exceed others, but to exceed themselves. It’s the brass ring that makes people want to ride the carousel. By definition, not everyone will win this prize, although anyone can. It is an unfortunate fact that at any given moment in life, some people actually are smarter, stronger, more talented, or more skilled than others. Did you inwardly wince when you read this statement? I did when I wrote it. This reaction is born of a thoroughly modern conceit. We seem to be in the midst of a trend toward mediocracy which, in its rush for warm, fuzzy nurturance has actively shunned any reason to strive for self betterment. Not every person automatically gets the gold star just for showing up. If you don’t understand this, the cold hand of reality will eventually spank you. That is not to say that every person who ever has or ever will be elevated is automatically deserving. All human institutions are fallible. However, in this case, two important things must be kept in mind. One — the system is very much self-policing. Two — at the end of the day, the SCA is a voluntary monarchy, and we all bow to the whim of the Crown. The goal of the Peerage in the SCA, then, is just that — to provide a goal. Whether that goal is achieved is a matter for debate, but the goal of the goal is the goal. Is that clear? Good. So then, how does one achieve this goal? All peerages that become vested in the individual are bestowed by seated royalty. 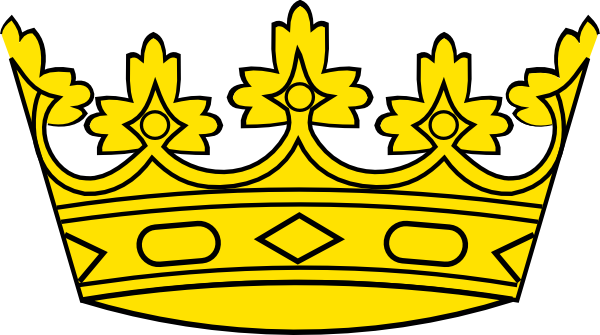 In the case of those referred to as ‘royal’ peers, when one Monarch steps down, their ascending heirs bestow rank and title upon them pursuant to their previous service as monarchs, including fulfillment of specific requirements when they served. 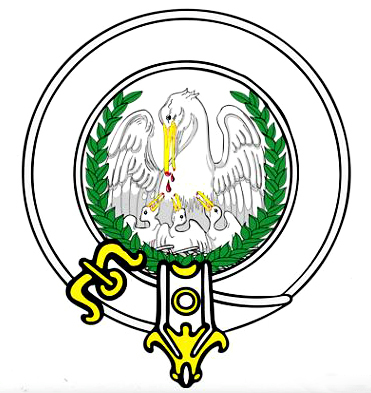 This rank is not universally guaranteed, and hence is not merely earned by right of arms. If a seated Monarch has displayed particularly poor judgement or bad behavior, it is within the rights of the heirs to deny them the Patent of Arms that normally accompanies their new rank. This is unusual, and can work a little differently from Kingdom to Kingdom, but it has happened. In the case of those peerages commonly described as ‘bestowed,’ elevation is achieved through dedication, hard work, and courtly grace. A Pelican is distinguished through service. A Laurel is distinguished through excellence in the arts. The martial peers have distinguished themselves through skill at armed combat. However, these are merely the core competencies. They are not the sole criteria. All of the peerages hinge on something more. It is a somewhat ineffable (and perhaps a bit recursive) notion referred to as “Peer-Like Quality” or PLQ. Here is where the unrepentant romanticism comes rushing back into the equation, and necessarily so. It is intimately bound up with the notion that a candidate for elevation is free to refuse the accolade. The candidate is delivered a writ which must be answered yea or nay. The candidate is expected to solemnly contemplate the gravity of the prospective elevation by sitting a vigil, and hearing the counsel of the peers in whose company he might soon stand. Again, it is uncommon, but candidates can refuse, and have done so. This element of choice is critically important. A peer is expected to express — and even amplify — the dignity of the Crown that elevated him. If the elevation was thrust upon him, it would be a heavy yoke indeed. OK, let’s say I’ve been named a peer. What’s next? It’s tempting to think that ascending to the ranks of the Peerage represents an endpoint. In many ways, it is only a beginning. For every candidate, the road to the Peerage is a long and winding pilgrimage. Being different people, we all have different aspects of ourselves we must hone and improve. Those efforts do not cease by royal fiat. Our flaws do not vanish by virtue of the fact that we have a new medallion. If anything, ascending to the Peerage means you have to work that much harder to insure your continued worthiness of the station you have attained. One thing that all peers must keep in mind is that we have been recruited into something much bigger than ourselves. Therefore, we must strive to think and act beyond ourselves. If you only see your elevation as a personal achievement, you’re deluding yourself. It takes a Kingdom to make a peer. Each of the peerages has an unspoken expectation for continuing dedication to others. Part of the responsibility we have accepted as role models is often to put the needs of others before our own. We lose sight of this not at our own peril, but at the peril of those who have suspended their disbelief long enough to look up to us. But what happens when these ideals you describe break down? The vagaries I’ve been discussing are not even codifiable. All of this hinges on the honor system, much as a Crown Tournament does. There is a presupposition that people will behave with honor befitting the station to which they aspire. Human nature being what it is, however, some do not always. My personal journey into the ranks of the Peerage has informed me that most often, when this happens, it is because someone somewhere has lost sight of the fact that there are times when others must come first. Or, perhaps, that notion is still present, but has become diluted or twisted, and the individual believes that his notion of the greater good is infallible, leading to a willful blindness to the harm that is caused. Less often, there can be a blithe ignorance of downstream consequences, leading to a Godzilla-esque rampage, the monster completely unaware of the train commuters he has crushed. I’ve seen it. I’ve done it. Sometimes it just happens. In these instances, it’s very tempting to just chuck the whole thing. Sometimes we look at peers behaving badly, and we stop wanting to try. Sometimes, we look in the mirror, realize our own mistakes are sizable, and think maybe slithering away is the best course. Neither of these things is appropriate. We only truly learn through failure. Everyone needs permission to fail, sometimes. If, however, you honestly believe that there can be no resolution, and that the entire system is so messed up that there is no saving it, then everything that countless good and noble people have worked so hard to accomplish for nearly half a century is for nothing. By all means — throw up your hands and walk away. You’re participating in the problem. But if some part of you can still see worth in this flawed gem of ours, then it’s still worth fighting for, flaws and all. If those who once inspired you have let you down, consider this. You were not idolizing that person. You were idolizing some ideal form of that person that you made up in your head. And guess what? That person could just as easily be you. You can fill that role. When your heroes stumble, don’t decry them and turn away in disgust. Become them. Take up the mantle, fix that ideal in your mind, and play the game better so that the next guy doesn’t lose hope. Can I ever really hope to become a peer? I don’t know. There are many paths. Some are easier for some people, and some are easier for others. There is no formula. However, there are some things that I believe will help, and these are true in the broader world as well. First — you must consider others. Help them to achieve the same goals you strive toward. Sometimes, along the road, there will be competitions, but overall, that’s not what this is. People do not need to climb over one another to reach this goal. If someone is working toward the same goal you are, work with them, not against them. By doing so, you show your true worth both to them and to everyone. Second — you must be passionate about what you do. Do it because you love it. Do not do it because you strive for reward. When you do that, you are making it about you, and it’s not. See rule #1. Third — you must participate. Don’t hang back in the shadows and then wonder why nobody sees you. If you are not innately outgoing, then this is something you need to work on. Do not be afraid to dive in. The rewards are always, ultimately, greater than the risks. People may not always respond positively to this. Tough. In every instance, when you are faced with negativity, respond with grace. Be the example. Thank you. At this time I amd a friend of mine are in the countdown to elevation. Yourbwords seem timely and your advice sound. Tha k you so much for this missive. Wow! Every Apprentice and Protogee needs to read this. You have really “hit the nail on three head”! Merci bien! **deep curtsey** Thank you for sharing that, gentle friend.